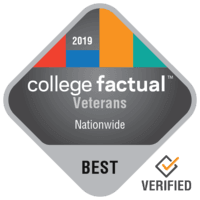 Nashville, Tennessee – College Factual recently released its 2019 Best Colleges for Veterans Rankings. This is a ranking of four-year colleges and universities in the United States. Read on to see how Belmont University performed in these rankings. Belmont is ranked #165 out of 1,820 for veteran friendliness of all colleges and universities reviewed by College Factual. This means Belmont is in the top 10 percent of all schools in the nation in the Best for Vets category. Belmont improved its ranking position 101 slots over the previous year’s ranking of 266. See the full Best for Vets ranking. Belmont is ranked #2 out of 39 colleges reviewed by College Factual in its Best Colleges for Veterans in Tennessee analysis. This puts Belmont in the top 5 percent of all schools in the state for veteran friendliness. Belmont improved its ranking position 1 slot over the previous year’s ranking of 3. See the full ranking of Best for Vets schools in Tennessee. This ranking was meant to highlight colleges and universities who are working hard to provide quality educational outcomes to veterans, active duty military students and their families. Some of the factors taken into account in these rankings include affordability to veterans, support services and resources specific to veteran needs, as well as overall quality metrics important to any student and quality metrics specifically important to students who are considered non-traditional. Learn more about our Best for Vets ranking. Belmont University is located in Nashville, Tennessee in a city environment serving approximately 6,300 undergraduate students and roughly 320 recipients of the GI Bill®. In addition to its other resources, Belmont has a recognized student veteran organization. The school has a student to faculty ratio of 13 to 1. Learn more about veteran resources available at Belmont. Learn more about College Factual and sign up for your free account. Get notified when similar news about Belmont University happens.